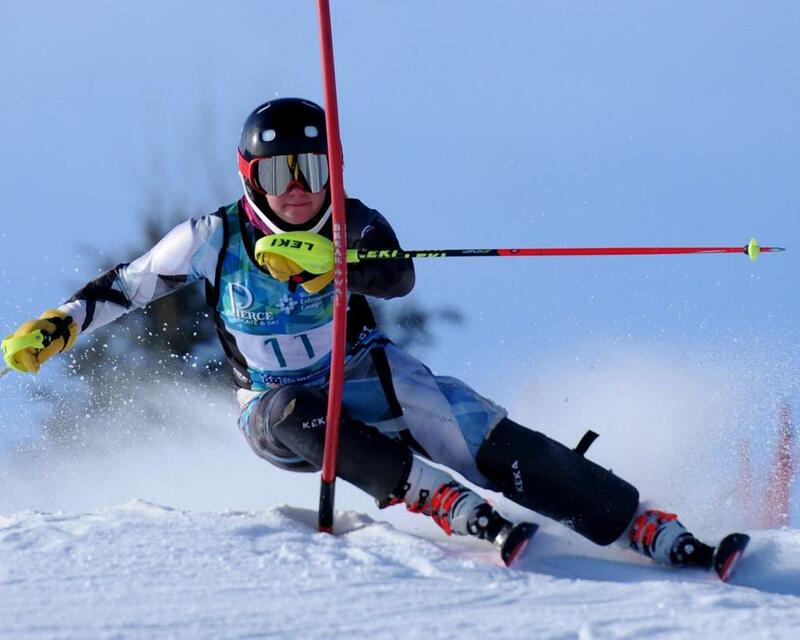 Lakeville South senior Lauren Geary competed in an Alpine event at Buck Hill in January. Photo by John Hofstad. Lakeville South senior Lauren Geary first took to the slopes as a fourth-grader. Geary’s first day as an Alpine skier at Buck Hill found her paired with another young girl of the same age, Becca Divine. The two have competed with and against each other ever since that initial introduction eight years ago. They will conclude their high school careers with one final meeting in the Alpine state meet Wednesday at Giants Ridge in Biwabik. Both are coming off completely opposite junior seasons. Divine is the defending state champion while Geary was sidelined the entire year after suffering an ACL injury to her left knee during a training camp run in Winter Park, Colo.
Geary finished third in the Section 6 meet at Buck Hill, behind Divine of Eden Prairie and Lakeville North sophomore Peyton Servais, who was fourth in the state meet a year ago. Geary was in first place after the first run before breaking a pole guard on the second run. “It forced me to make a couple of mistakes,” Geary said. She has a lot of respect for Divine, and knows exactly what it will take to finish her prep career with a state championship. Geary and her teammates also will be in the running for the team title. Stillwater is the defending state team champion. There will be a new individual boys’ champion as Hermantown medalist Austin Danelski graduated. Eagan sophomore Camden Palmquist, last year’s runner-up, also won’t be participating after missing the Section 6 race to compete in the Pokal Loka at the Stari Vrh Ski Resort in Skofja Loka, Slovenia, from Feb. 3-10. Two-time defending team champion Minnetonka will be tough to beat in its quest for a three-peat. Lake Conference rival Edina and Lakeville South will try to bring the Skippers’ run to a halt. Top-ranked Armstrong is going to be tough to beat in its quest for a second girls’ team championship on Thursday. The Falcons won their first title in 2016. Lucinda Anderson, Mae Barnes and Leah Rudd highlight a senior-laden group, who finished third a year ago. Wayzata senior Mara McCollor is the No. 1-rated individual while Anderson is ranked No. 2. McCollor is the defending state champion. No. 3-rated Stillwater is looking for back-to-back titles in the team competition. The No. 1-ranked boys’ squad St. Cloud Cathedral/Sartell-St. Stephen is led by the Nemeth family — senior Alex, juniors Will and Zach and eighth-grader Jonathan. Alex, the top-ranked individual, finished first in the Section 8 meet, with Zach placing second and Will taking third. Grand Rapids senior Garrett Beckrich is the defending individual champion. He is ranked No. 2 behind Alex. Wayzata is also looking to go back-to-back in the team competition. Alpine schedule: First run, 10 a.m.; second run, 1 p.m.
Nordic schedule: Boys’ 5K freestyle, 10 a.m.; girls’ 5K freestyle, 11:15 a.m.; boys’ 5K classical, 2 p.m.; girls’ 5K classical, 3 p.m.